Counter weight Limit Switches are used for Heavy duty E.O.T. Cranes, Hoists to prevent over travel of hoisting motion on power and control circuit up to 500 V and 40 Amps. continuous current. 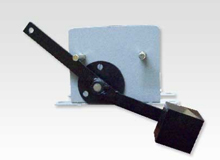 The limit switch normally remains closed and cuts off power to stop the motor of the crane. The Counter Weight limit switch operates when it reaches a predetermined position when the weights rest on the surface of the limit switch. Supplier of Counter weight Limit Switches and manufacturer of Counter weight Limit Switches. Pethe Industrial Marketing Company Pvt. Ltd. is the leading manufacturer of Counter weight Limit Switches in India. Pethe Industrial is the leading supplier of Counter weight Limit Switches in Mumbai, Maharashtra, Gujarat, Delhi, and all over India. • Body material is made of Aluminium / CI casting. • Enclosure is of IP-44 / IP-55 degree of protection. • Mounting position is Vertical. • Mode of operation is 1 way self resetting. • Contact material is of silver cadmium. • Any other specification can be manufactured upon request.